Marie Embry helps a student with a math problem. Photo by Andrew Cluley. Students in Marie Embry’s fifth grade classroom at Pattengill Elementary who are new to the school have a teacher that can relate. Embry went to four different schools in four years as work promotions forced her father to move frequently. Embry currently lives in Ypsilanti with her husband, ten-year-old son, nine-year-old daughter, and a two-year-old dog. She double majored in language arts and social sciences at the University of Michigan and also has a master’s degree in reading from Eastern Michigan University. What led you to a career in teaching and specifically focusing on upper elementary? My fabulous 2nd grade teacher, Mrs. Hamilton, was one of my first inspirations to become a teacher. 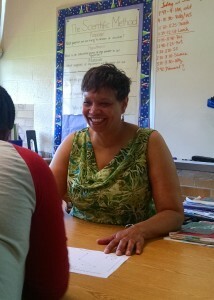 She was gentle, funny, and engaging in her teaching. In the beginning, she was the reason I wanted to teach lower elementary but then I did my student teaching in fifth grade and loved it. The students are still young enough that they look at our classroom as a second family, old enough to do challenging work, and they usually get my jokes! What’s the most rewarding aspect of teaching? It’s difficult to choose just one reason. I love it when my students get the “ah-ha” moment. Sometimes it happens quickly and sometimes it is a long process but in the end, every time it’s worth the effort. It’s also incredibly rewarding to have students come back and tell me they remember my class and the things we did, or that the things they learned in my class helped them as they went through school. What are the biggest challenges in teaching today? Teachers face many challenges today depending on where they teach. We are not just teaching the curriculum, we are teaching the whole child. You can’t separate what we do within the walls of the school from the life of a student outside of school. We often are dealing with students who have a challenging home life, haven’t had breakfast, or come to us several grade levels behind in school. We have to be committed to meeting the needs of all the students regardless of where they are: those who are struggling and want to do well, students who are struggling and don’t yet know how much they can do, and students who are excelling and need constant challenges. What advice would you give to students considering becoming a teacher or someone just entering the profession? My advice would be to find a mentor in the profession who really loves what they do. There is no perfect teacher but there are plenty who are committed to continually growing, learning, and improving his or her practice. Issues around education are constantly in the news and it can be easy to get caught up in negative press or with people frustrated with the system. New teachers need to keep reminding themselves of the positive change that they can make in the lives of their students. What are the most important things a parent can do to help a teacher get the most out of a student? When parents are engaged with their children around school, it helps create a partnership that reinforces my work in the classroom. One of the most important ways for parents to help is to read to or with their child. Most of the curriculum that students encounter is language based. If a child has difficulty reading, it will affect other areas of learning. Reading together also gives parents a touchpoint for conversation and a way to gauge their child’s progress. Parents should also talk to their child about his or her day. Not just “How was your day?” but something specific. You can ask “What is the best/worst thing that happened today? What is one new thing you learned today? Who would you sit by if you could sit by anyone and why?” Parents can learn a lot about what is happening in a classroom and how their child feels about school. If a child enjoys going to school the learning is a lot easier and parents can help to foster positive feelings about school. What’s one of your most memorable moments or funniest things that has happened in your classroom? One morning I was teaching a guided reading lesson and a big spider dropped right down on the middle of my table. I have an irrational fear of spiders so, of course, I yelled and jumped out of my seat! My students, knowing how I felt (because I had been absolutely clear about my feelings about spiders), immediately moved my books aside, quickly scooped the spider up and got it out of the room. I knew in that moment that my students would help me out when I needed it just like I was there to help them. What do you do in your free-time to recharge and relax? I love to read, usually mysteries. I have also started practicing yoga to relax. Now that it’s getting warm out my husband and I, along with our son and daughter will be taking some long bike rides. Wow, that was a great article. Thank you for your hard work, dedication, and for inspiring our children. Your students are very fortunate to have an invested teacher like you . Keep up the great work!